The past met the future for a few fleeting moments, as I drove an electric Ferrari. 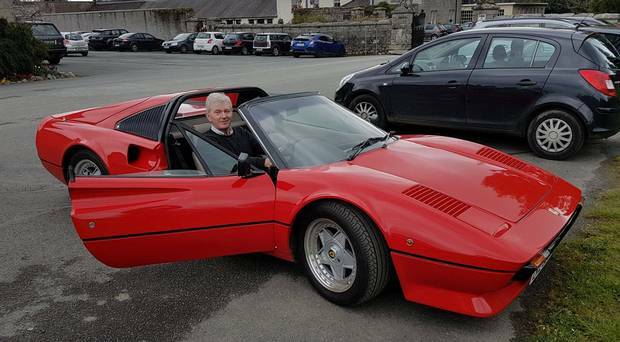 Time took a back seat as I got behind the wheel of a 1981 classic (the Ferrari 308 GTS) that has been transformed into a modern bolt of lightning. It’s now called the 308 GTE – to highlight its electric status. Before I set off, they told me it could eventually catapult from a standing start to 100kmh in three seconds or so. After driving this shooting star on a straight stretch at Enniskerry, Co Wicklow, I believe them. It just went whoosh. Top speed is a claimed 300kmh. I believe them. The 600bhp extravaganza is the brainchild of Co Cork man Norman Crowley, who also promises to have a unique, first ‘Irish supercar’ on the market next year. His company, Electrifi, is being launched today, with the aim of developing a range of electric classic cars. We can expect to see anything from a Porsche 911 to a Volkswagen Beetle to a Fiat 500 being driven by battery power. Welshman Richard Morgan, whose ECC company is now on board with Electrifi, outlined with Norman how some of the greatest cars ever built are also being rejuvenated – reborn even – thanks to electric technology. As well as re-constituting old motors, they are building classics, such as the immortal Jaguar E-Type, from the ground up – and packing in 21st century technology such as digital dashboards and power steering in the process. How is that for a blend of past and present? And there is one great twist to the prevailing ‘Back to the Future’ theme: they plan on making an electric DeLorean before long. The Ferrari has a range of 160km or so – though not at the sort of speed it can do – while recharging is simple and straightforward. Zipping down the road in the car, however, all such realities were blown away by the sheer power and potential of this electric classic to excite and entice. Did we ever think we’d see the day?